Chinese regulatory agency TENAA has certified the Gionee F105, a mid-range handset that features a 5-inch screen with a 720 x 1280 resolution. Under the hood is a quad-core 1.3GHz CPU. 2GB of RAM is inside, along with 16GB of native storage. A 128GB capacity microSD slot is available for those requiring additional storage. The Gionee F105 will sport an 8MP rear-facing camera, with a 5MP front-facing camera provided for selfies and video chats. A 2400 mAh battery keeps the wheels spinning, and Android 5.1 is pre-installed. The device measures 8.1mm thick and weighs in at 155 grams. It will be available in White and Gold. While there is no word on pricing or availability, that information should be revealed in the near future. 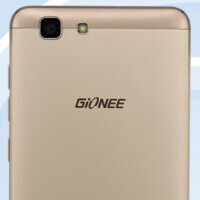 Now that the handset has been paraded past TENAA, it shouldn't be terribly long before Gionee makes it official. If you're looking to see what the Gionee F105 offers in the looks department, click on the slideshow below for the usual photos from the regulatory agency. will definetely be around 150-200 dollars.